Geneva – IOM, the UN Migration Agency, reports that 67,122 migrants and refugees entered Europe by sea in 2018 through 26 August, with 27,994 to Spain, the leading destination this year. This compares with 123,205 (172,362 for the entire year) arrivals across the region through the same period last year, and 272,612 at this point in 2016. Spain, with 42 per cent of all arrivals through the year, continues to receive seaborne migrants in August at a volume more than twice that of Greece and more than four times that of Italy. Italy’s arrivals through late August are the lowest recorded at this point of a normally busy summer sailing season in almost five years (see chart below). IOM Rome on Monday reported that late Saturday, after a prolonged delay, all the migrants on the Italian Coast Guard ship Diciotti were allowed to disembark into Italy. The 190 migrants (mostly Eritreans and Somalis) were rescued by the Diciotti on 15 August. However, the ship was permitted only the evacuation of 13 migrants (for medical reasons) before being ordered to wait at anchor off the coast of Lampedusa. That lasted five days, before the Diciotti’s crew received authorization to move their vessel to the port of Catania. The remaining migrants then remained on board five additional days in the port of Catania, as Italian authorities were unable to authorize their landing – because the Italian authorities insisted they would not authorize disembarkation until there was an agreement to relocate them to other EU Member States. Following several humanitarian appeals (both IOM and UNHCR asked the Italian Government to allow these migrants to disembark) only the minors were permitted to leave the ship by Thursday evening. While an agreement was not reached at EU level, all the migrants ultimately were allowed to disembark on Saturday night, when the Italian Minister of Interior announced that 20 migrants will be relocated to Albania and 20 to Ireland, while 100 would be welcomed by the Vatican – within Italian territory, however, on property administered by the Holy See. According to testimonies gathered by IOM staff from the minors who disembarked Thursday evening, the migrants – all malnourished and exhausted – reported having been arbitrarily detained for up to two years in Libya, where many of them had been beaten and tortured by smugglers and traffickers seeking ransom money from their families in their countries of origin. Moreover, Italian doctors who attended the women on the Diciotti reported that many of them had been raped while in Libya. “Migrants arriving from Libya are often victims of violence, abuses and torture; their vulnerabilities should be timely and properly identified and addressed,” added Federico Soda, Director of IOM’s Coordinating Office for the Mediterranean and Chief of Mission for Italy and Malta. IOM’s Missing Migrants Project (MMP) has documented the deaths of 1,549 people on the Mediterranean in 2018. Most recently, in the Western Mediterranean, the Spanish Guardia Civil recovered the body of a young Sub-Saharan man near Alboran Island on 24 August. A merchant vessel had spotted his body, along with the body of another migrant, and had alerted Spanish authorities. A search operation is still underway to find the remains of the other migrant, which have not been located as of 27 August. On 24 and 25 August, the remains of two individuals were recovered off the coast of Djerba in Tunisia. They are believed to have died in a shipwreck that took place on 20 August off the coast of Djerba. The current death toll from that shipwreck stands at eight dead and one missing. One survivor was rescued by the Tunisian National Guard. 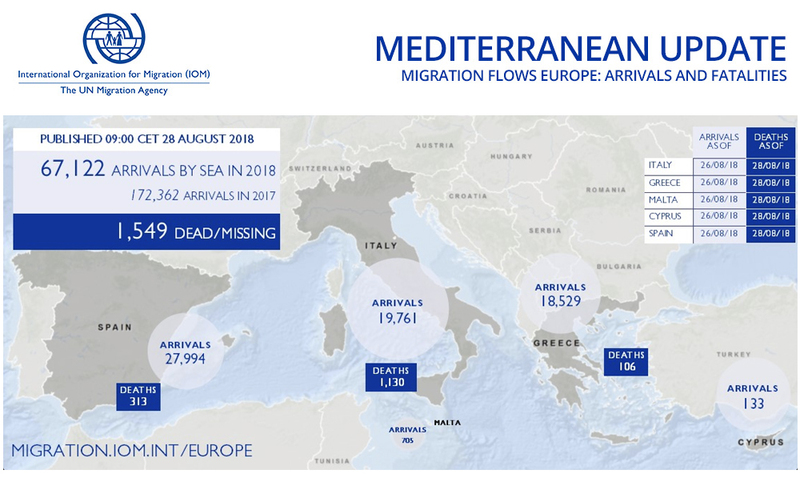 IOM Spain’s Ana Dodevska reported that total arrivals at sea in 2018 have reached 27,994 men, women and children who have been rescued in Western Mediterranean waters through 26 August (see chart below). She further reported that starting Sunday (26 August) a new, temporary, Motril-based reception centre for foreigners has become operational. This centre can accommodate a total of 250 migrants. A similar reception centre – the first of its type – also became operational at the Port of Crinavis in San Roque on 2 August. Currently, the centre in San Roque remains the largest centre of this type in Spain with a total capacity of 450 persons. IOM notes that over this year’s first five months, a total of 8,150 men, women and children were rescued in Spanish waters after leaving Africa – an average of 54 per day. Since 31 May, a total of 19,844 have arrived – or just under 230 migrants per day. The months of May-August this year have seen a total of 23,367 irregular migrants arriving by sea, the busiest four-month period for Spain since IOM began tallying arrival statistics, with just under one week left in August. June remains the busiest month for irregular arrivals this year – nearly 8,000 men, women and children via Western Mediterranean waters – while August looks to be on track to receive slightly fewer than that, with around 6,500 migrants expected (see chart below). On Monday, IOM Athens’ Antigoni Avgeropoulou reported that from Thursday (23 August) through this past Sunday, the Hellenic Coast Guard (HCG) was involved in at least eight incidents requiring search and rescue operations off the islands of Samos, Lesvos, Chios and Kos. The HCG rescued a total 297 migrants and transferred them to those islands. Additional arrivals to Samos, Kos, Agathonisi, Farmakonisi and Lesvos of some 277 men, women and children brings to 18,529 the total number of arrivals by sea to Greece in 2018 through 26 August (see chart below). IOM’s Marta Sanchez reported Thursday IOM’s Missing Migrants Project has documented the deaths worldwide of 2,481 people during migration to international destinations in 2018 (see chart below). Besides the recent deaths in the Mediterranean, MMP recorded the deaths of three people on the US-Mexico border. Authorities reportedly found the remains of two people recovered from the banks of the Río Bravo. On 23 August, the body of a woman was found near Colonia Claudette in Nuevo Laredo, Tamaulipas. The next day, 24 August, Mexican civil protection authorities retrieved the body of a man near Reynosa Díaz in Tamaulipas. Earlier that week, on 21 August, US Border Patrol agents found the body of a man in a water basin south of Mercedes, Texas. In Mexico, two Guatemalan migrants, a 14-year-old girl and a man of unknown age, died in a vehicle accident in Parras de la Fuente, Coahuila on 25 August. Five migrants who were travelling with them suffered injuries. On 26 August, a man of unknown nationality was found dead near train tracks between the municipalities of Chinameca and Oteapan, in Veracruz. He likely fell from the top of a train car on which he was making his way to the US border. The Missing Migrants Project team also received information about two other train accidents in which Honduran nationals lost their lives earlier in the month. On 4 August, a 42-year-old Honduran man was killed by a freight train near Charcas, in San Luis Potosí. On 6 August, a 26-year-old man was found dead near train tracks in Parras de la Fuente, Coahuila. He has been identified and his family notified through the Honduran Consulate in Coahuila, which has started repatriation proceedings. In the Caribbean, three migrants from the Dominican Republic went missing on 15 August when they were trying to reach Puerto Rico by boat, according to the US Coast Guard, while 24 others were rescued.